A sponsored project by American Eagle Outfitters examining the future of retail in their brick and mortar stores. Please get in touch to speak more about this. Through user-research with customers, we learned about the pain-points of the current existing system as well as the challenges created by adding more technologies in. We aimed to create a space that could be used both as a digital and analogue service and that contained a variation of high-tech and low-tech solutions. 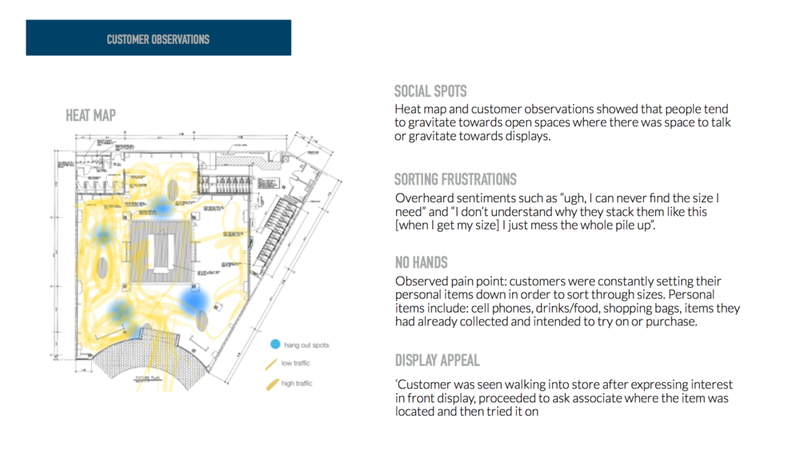 This work imagines the future of retail in brick and mortar stores. It redesigns the shopping experience to accommodate for new technologies and respond to customer and employee pain-points discovered through various user research methods. I was responsible for the research methods used to inform the final proposal. I used methods such as interviewing across various retail environments, data tracking, and user testing to gain insights which informed prototypes and concepts presented weekly to American Eagle Outfitters corportate offices. Working with industrial designer Vivian Qiu, our solution combined both tangible touch points and digital technologies in order to simplify the process of browsing and finding clothes. We presented our final proposal and insights at the AEO national headquarters in May 2016.